See how in-memory processing built into SQL Server 2014 delivers breakthrough performance to accelerate your business and enable new, transformational scenarios that make you more competitive. Microsoft offers comprehensive in-memory technologies for OLTP, data warehousing, and analytics built directly into SQL Server, so there is no need to buy specialized hardware, expensive add-ons or learn new skills to speed your transactions, your queries and your insights. In addition, SQL Server 2014 also provides new hybrid solutions for cloud backup and disaster recovery as well as takes advantage of new capabilities in Windows Server 2012 R2 to provide enterprise-class availability and scalability with predictable performance and reduced infrastructure costs. SQL Server 2014 also continues to offer industry leading business intelligence capabilities and integration with familiar tools like Excel for faster insights on your data. In-Memory OLTP: Provides in-memory OLTP capabilities built into core SQL Server database to significantly improve the transactional speed and throughput of your database application. In-Memory OLTP is installed with the SQL Server 2014 Engine without requiring any additional actions and allows in-memory performance benefits without rewriting your database application or refreshing your hardware. In-Memory OLTP allows you to access the other rich features in SQL Server, while taking advantage of in-memory performance. In-Memory Updateable ColumnStore: Provides higher compression, richer query support and updateability of the existing ColumnStore for data warehousing workloads giving you even faster load speed, query performance, concurrency, and even lower price per terabyte. o New AlwaysOn features: Availability Groups now support up to 8 secondary replicas that remain available for reads at all times, even in the presence of network failures. Failover Cluster Instances now support Windows Cluster Shared Volumes, improving the utilization of shared storage and increasing failover resiliency. o Improved Online Database Operations: Includes single partition online index rebuild and managing lock priority for table partition switch, reducing maintenance downtime impact. Encrypted Backup: Provides encryption support for backups, on-premise and on Microsoft Azure. IO Resource Governance: Resource pools now support configuration of minimum and maximum IOPS per volume, enabling more comprehensive resource isolation controls. o SQL Server Backup to Azure: Provides management and automation of SQL Server backups (from on-premise and Microsoft Azure) to Microsoft Azure storage. o AlwaysOn with Azure Secondaries: Easily add replicas in Microsoft Azure to on-premise Availability Groups. 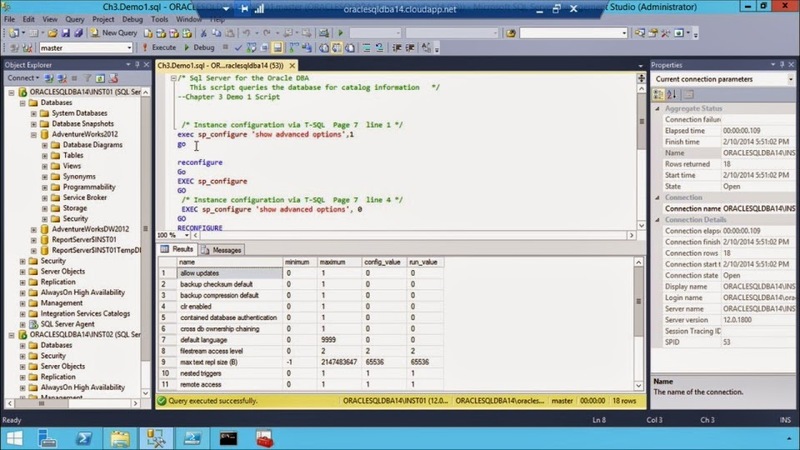 o SQL XI (XStore Integration): Supports SQL Server Database files (from on-premise and Microsoft Azure) on Microsoft Azure Storage blobs. Note: Downloading from this link and signing up to technet has more benefits and trustworthy links for download and software.